The view on the Fall day when I visited Powder Mountain. Powder Mountain is located in Eden, about one hour from both Park City and the Salt Lake International Airport. With the largest skiable terrain in the U.S. (8,464 acres), it may be one of Utah’s best kept secrets. The mountain opened in 1972, but the Powder Mountain of today has been coined a Utopian Ski Community. 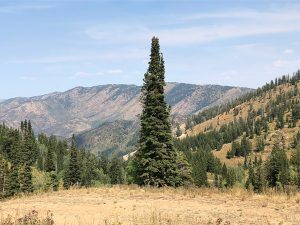 I visited Powder Mountain last week because I was curious about the real estate offerings. Here’s what I learned. In 2013, Summit partnered with a local investor to purchase the mountain. The vision is to maintain the bohemian, wide open feel of the mountain and incorporate the principles and philosophies of Summit into a new community. To understand Powder Mountain, you need to first understand a little bit about Summit. They are a highly curated group of executives, educators, artists, visionaries, athletes, scientists and thinkers who get together regularly for lectures and retreats. Summit has been described to me by one of its members as “Davos meets Burning Man”. Whoah. The exclusive and eclectic group that makes up Summit is what gives the vision at Powder Mountain its soul. The custom homes being built at Powder Mountain are the most advanced architecture I have seen in Utah. 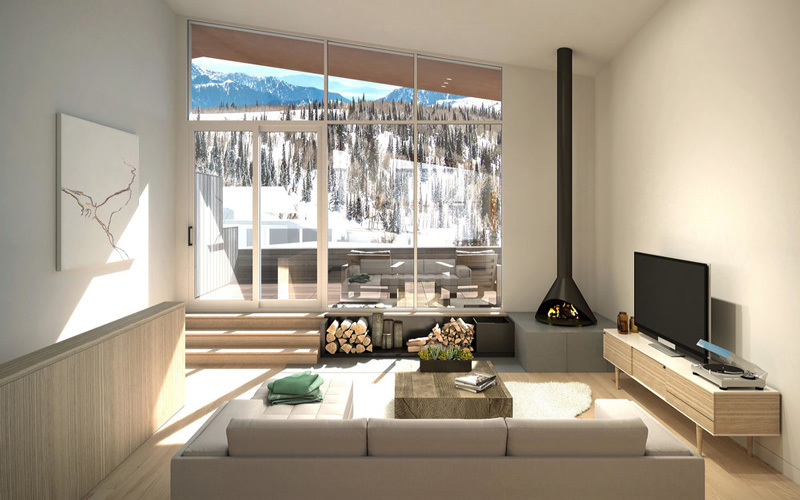 The only exception is The Residences at Goldener Hirsch in Park City, designed by Tom Kundig, who is designing several homes at Powder Mountain. 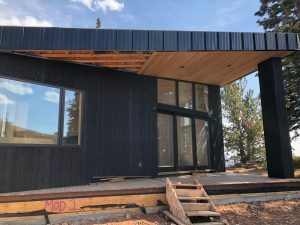 Architects from around the world are using advanced architectural designs and materials to build stunning homes that meet Powder Mountain’s unique architectural guidelines. Summit is creating “developer” properties to complement the custom homes being built on its first release of lots. There are currently 2 such communities, “Horizon” and “Copper Crest West”. Horizon is a group of 30 single family homes interconnected by boardwalks and bridges. 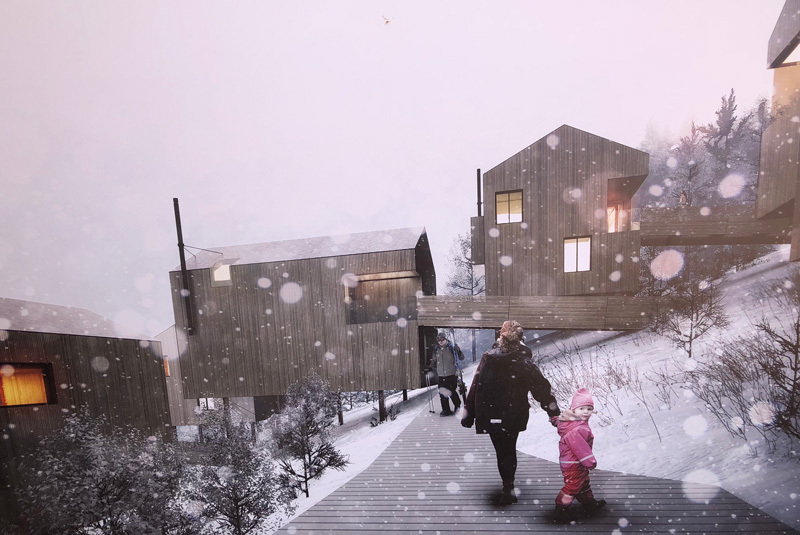 Since community is such an important part of Summit, a private amenity for the 30 homes called “Pioneer Cabin” will be part of this special neighborhood. Pioneer Cabin will include ski lockers, a spa/steam room, changing room, multipurpose room for kids, kitchen, and lounge. There are currently 4 different plans to choose from. They range in size from 1,290 to 3,000 square feet and are priced from $1.3 to $3 million. The architect for the Horizon neighborhood is Brian Mackay-Lyons, from Nova Scotia. Mackay-Lyons was chosen because he has already created a utopian community called “Shobac”, a community with ambitions similar to that of Summit. All the Horizon homes have southwest facing views to maximize the experience of beautiful sunsets. The style is “heritage modern”, with large glass windows to take advantage of the views and natural materials to blend with the environment. Take a tour of the Horizon community. Copper Crest West residences will be ski-out townhomes in the heart of the to-be-built-village. Designed by the Architectural & Environmental Design firm Studio Ma, the architecture and materials of these townhomes are also inspired by the land. The townhomes are wrapped in reclaimed wood siding and have metal roofs. Prices start at $1.5M. Take a tour of the Copper Crest West community. The skiing at Powder Mountain is rated 18% easy, 29% intermediate and 53% advanced. Ticket sales are limited to just 1,500 people per day. And while there are over 8,400 acres of terrain, only 1,000 acres are serviced by lifts. How does one ski the rest of the mountain? Cat skiing is very popular. In addition, there is a bus that makes its rounds on the roads picking up skiers and boarders who have carved their own path to the bottom of the hill. If you are a skier who loves trees and powder, this could be your mountain. A regular season pass costs $970.00 and several other “deals” are offered on the website. Do I know people who own properties in both Powder Mountain and Park City? Yes. They are quite different experiences. Powder Mountain is like an exclusive, utopian club for people who value solitude and community at the same time. Park City is a town with a bustling nightlife. If you are curious about the Powder Mountain experience, please call me and I’ll fill you in with more details that I learned on my tour and send you a cool brochure. If you have skied Powder Mountain, I would love to hear about your experiences there. Great post! I skied Powder Mountain several years ago and it was one of the most memorable ski days of my life. The terrain was spectacular and varied. It definitely had a retro vibe and you felt like you had the entire mountain to yourself. Look forward to returning soon! Thanks for your comment, Lori! I’ve never skied Powder Mountain.